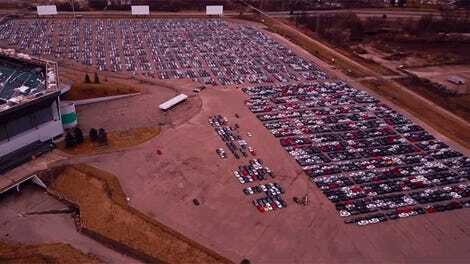 Last weekend, I took a trip to the Pontiac Silverdome, the abandoned Michigan stadium parking lot housing thousands of cheating Volkswagen diesels. As I filmed the sea of disgraced automobiles, a Dodge Challenger decided to rip some smoky burnouts. Ever since VW’s Dieselgate buybacks, the Pontiac Silverdome parking lot has become a visually stunning place to visit. That drone footage we shared showing an aerial view of the thousands of bought-back TDIs may as well have had Sarah McLauchlin’s “Arms of An Angel” playing in the background; the sight is truly moving. As I stared out into the vast seas of Volkswagen TDIs that once loyally served their owners, I couldn’t help but be overcome by somber feelings. Cars are so much more than just material objects; they take on personalities, and that’s obvious by the dozens of people who have written about how much they miss their lovely TDIs. Now to see all of these cars scared and alone, awaiting their fate as the EPA and California Air Resources Board assess VW’s proposed fixes—plus, add the once thriving but now abandoned Silverdome in the background. I was having “a moment,” you might say. But then a driver in a Dodge Challenger said enough with my “moment,” and totally changed the mood from somber to just downright outrageous. On the public roads of Pontiac, a city in southeast Michigan with a dwindling population (due in part to GM plant closures) this guy just hooned his 6.4-liter-powered muscle car without any fear of repercussion. It was properly absurd. He left a nice round circle on the pavement, which will fit right in with the rest of the burnout marks on Pontiac’s neglected roads. This whole thing was just weird. It's A Sad Tale. But It Was Interrupted By 6.4-Liters Of Hemi.